A great project for a beginning DIY woodworker is a bookcase. With so many choices, it is hard to choose just one. 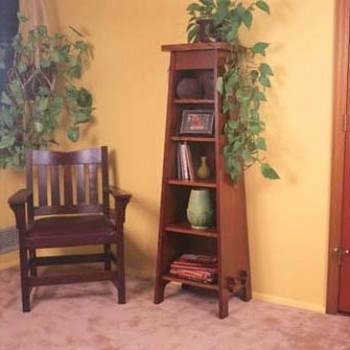 Build a bookcase to fit your room and budget with plans that are simple and easy to customize. Select wood that blends with your decor, or use inexpensive MDF material to create a bookcase that is strong and durable. Paint to match your trim or molding, or use a bright paint to bring a spark of color to perk up a room. When you build a bookcase, you save money and have the added bonus of creating furniture that is exactly the right size and shape to fit the space. Select a modular bookcase, ladder bookcase or a charming playhouse bookcase. Add storage, display and style to any room with a custom-made piece you will enjoy for years. A tall, slanted bookcase or knick knack holder in a turn-of-the-century design. 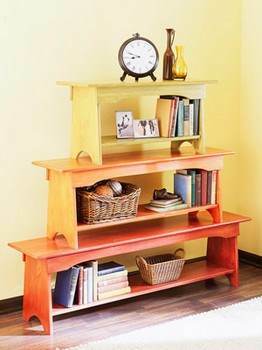 By stacking picnic benches that have been stained or painted you can create a unique and attractive bookcase.